With the Pokémon franchise being as super effective as it was during the late '90s due to its handheld games, trading cards, television anime and manga, it was only a matter of time before fans saw the groundbreaking series grace the home console territory - and that it did. 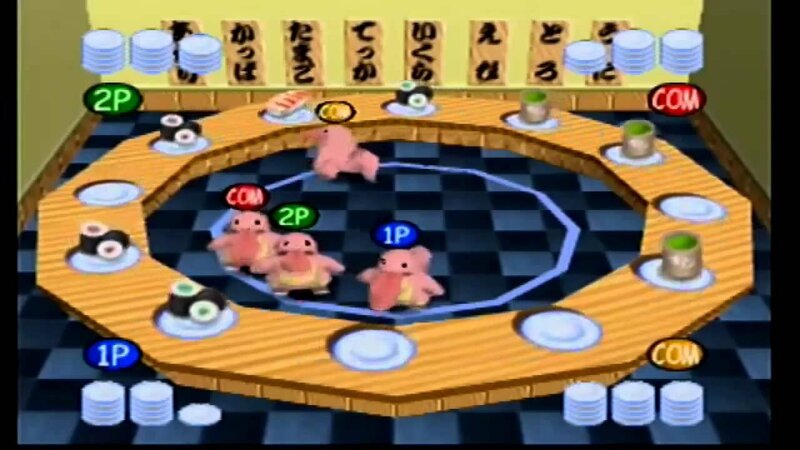 Pokémon Stadium was released on the Nintendo 64 in the year 2000 (1999 for Japan), and it arguably fulfilled every Pokéfanatic's dream: bringing everyone's favourite 151 critters to life in 3D. 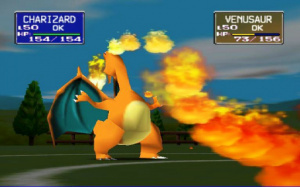 Pokémon Stadium's gameplay is how many expected it to be, that being the conventional formula of a turn-based battler using the familiar creatures from the Game Boy games. The major difference, though, was being able to see each monster and its attacks in breathtaking full 3D motion. It was definitely something to behold at the time, for fans of the series only really had the manga, anime and the sprites from Pokémon Red, Blue, and Yellow to visualise each Pokémon in all their glory during battle. Each battle had life breathed into it due to the game's stunning - at the time - visual effects, as well as an enthusiastic announcer who kept the excitement going throughout each bout. Whether it was charging up for a "Solar Beam" or landing a "Horn Drill" attack, the announcer made sure players were entertained and enthralled. With all that being said, however, it could be argued that having to watch every animation really slowed down the flow of matches due to possessing the same turn-based mechanic of the Game Boy games - but hey, that's the bread and butter of the Pokémon concoction! 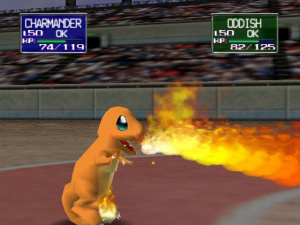 Another major difference between Pokémon Stadium and its Red, Blue, and Yellow counterparts was the fact that the game did not possess a storyline. However, for those revisiting the game now it's worth pointing out there are single player modes - challenging ones at that - such as Stadium mode that allows players to earn trophies by competing in certain Cups that each have their own set of rules and restrictions, as well as the Gym Leader Castle that lets players challenge the eight Gym Leaders of Kanto, followed by the Elite Four and finally the Champion. Afterwards, players can encounter an epic showdown with one tough Mewtwo, where only the mightiest of fire-breathing and storm-bringing 'mon may survive. Defeating Mewtwo unlocks a hard mode of the game, meaning everything will need to be completed again. Once done, Mewtwo can be challenged again, but you'll need six extremely strong Pokémon to take down the genetic freak. With all that in mind, it's fair to say there's plenty of single player content to keep those on their own filled with things to do, especially as these challenges aren't easy to clear. If you're playing alone and are getting a little tiresome of battling, Pokémon Stadium offers something that this writer thinks is still quite remarkable, and that's the GB Tower. This area of the game enables players to play Pokémon Red, Blue, or Yellow on their television screen! Sure, it may not sound as glamorous now, but at the time this was a tremendously exciting feature. No more did we need to find a source of light to hold our Game Boys under, and no longer did we need to rinse through hundreds of batteries throughout our adventure - though arguably this was part of the magic of Pokémon back in the day. This can be achieved by inserting the Transfer Pak (a device that comes with the game) into the back of the N64 controller, with the game of choice inserted into the gadget. 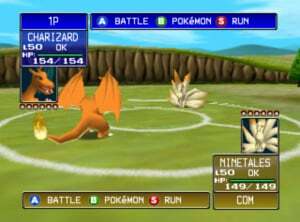 This nifty feature of Pokémon Stadium enables players to continue their handheld adventures onto the big screen, with the option to play in both double and triple speed settings, making long-winded battles a thing of the past (let's not forget the lack of Running Shoes at the time!). 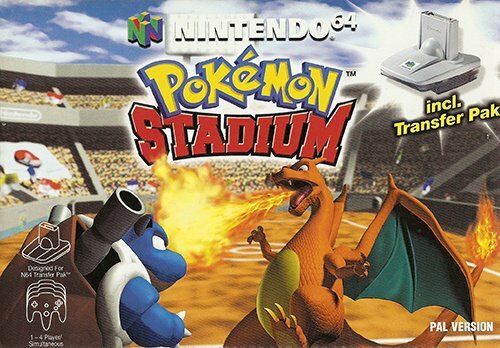 The awesome part of it all, though, is being able to transfer your caught and raised 'mon between these games and Pokémon Stadium, meaning they can be used for battle instead of using Stadium's ordinary rental monsters. This writer will never forget the excitement of transferring his newly-caught Mewtwo into Pokémon Stadium, letting him witness the almighty life-form in a beautiful 64-bit representation. The Pokémon Lab is a nice touch to Pokémon Stadium for those who really want to graduate from the university of Kanto. Here, players can organise their Red/Blue/Yellow PC boxes, as well as access basic information about each Pokémon caught in their handheld adventures, including moves and stats etc. 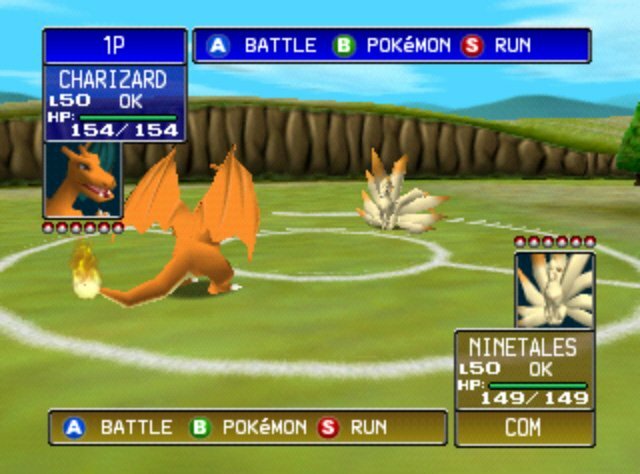 Pokémon and items can also be stored within Pokémon Stadium's own boxes, enabling players to obtain even more monsters and items than they usually could within the Game Boy games. Pokémon can even be traded between two plugged-in cartridges (meaning two plugged-in Transfer Paks). However, Pokémon Stadium's rental Pokémon cannot be transferred for obvious reasons. The Pokédex mode of the Pokémon Lab allows players to marvel at their Pokémon in 3D as well as obtain their Pokédex information – a sweet feature that's likely to satisfy the taste buds of every Pokénerd's appetite. Each Pokémon's location can also be viewed on a map of Kanto, which even includes the level in which they are found. Finally, the Pokémon Lab can be used to receive prizes that can be won within the other modes of the game, such as a Pokémon (Bulbasaur, Charmander, Squirtle, Hitmonlee, Hitmonchan, Eevee, Kabuto, and Omanyte) that can be transferred over to players' Game Boy adventures. On original release this was a great way to grab the remaining Pokémon players couldn't get on their single adventure play-throughs, as you could only choose one starter (unless the player was playing Yellow), obtain one of the two "Hitmons", obtain one Eevee, and choose one of the two fossilised Pokémon. This meant completing the Pokédex was easier to achieve if players didn't have the luxury of trading with friends. 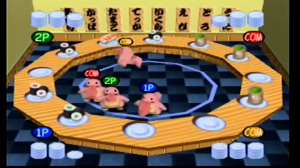 Pokémon Stadium also offers a mini-game area, the Kids Club, which takes a handful of Pokémon and inserts them into fun micro game environments that are suited to their traits. Kids Club offers nine mini-games, which can either be played individually or as part of a tournament; up to four players can take part, with any remaining spaces being controlled by the computer AI. It's a fun way to enjoy the franchise's characters without a constant focus on battling, and it compliments the rest of the game with a light twist. Those who are fans of the Mario Party series may enjoy this mode, as some of the mini-games can certainly become both addictive and competitive. There are further subtle yet effective elements that Pokémon Stadium brings. For one, its hub acts as a city that introduces players into the world of Pokémon. Each area of the game is represented by a building or attraction of the city, in which the player must navigate to using their orbiting Magnemite cursor. This really raises the bar in terms of UI/UX right from the get-go, as players are immediately absorbed within the game's world and introduced to some of the Pokémon they're about to encounter, all while effortlessly navigating the game's gameplay options. The hub is even changed when Mewtwo is ready to challenge you, as its glowing silhouette graces the area above the Stadium, turning the sky dark and eerie. Pokémon Stadium also boasts a delightful soundtrack, containing repurposed and remastered favourites from the series' iconic playlist. Further minor delights include Pokémon possessing slightly different colour shades, signifying a rival's Pokémon or Pokémon transferred/being used from a Red/Blue/Yellow save file. Bear in mind, this was seen during a time where shiny Pokémon did not exist, so it was pretty cool to see our favourite monsters in an adjusted colour palette. All in all, Pokémon Stadium was a revolutionary step up for the monster catching franchise - and that's not just due to the fact that we got to see all 151 critters in full-fledged 3D. Like Super Mario 64, Pokémon Stadium went over and beyond the transitional 3D hurdle with its inclusion of the GB Tower, as well as allowing players to experience Pokémon characters in new ways through mini-games and the Pokémon Lab. Played today, the game provides a healthy number of alternative ways to enjoy the franchise beyond the main series adventures, but at the same time tightly integrates itself with those classic Game Boy titles, which enhances play-through experiences from both handheld and console standpoints. Sure, the battling can get a bit repetitive and lengthy due to the turn-based system, but the awesome visuals, animations and commentary can help keep this from becoming mundane. After I turned (insert legal drinking age here) I rediscovered Pokemon stadium's minigames with my friends. Forever synonymous will the smell of "milk" and Gutsy Golbat be the bane of my existence. Love this game. Can we get a picture of Arjun in his onesie? Without transfer mon's from the games, it was a game of your luck. This should be able to connect with the 3DS VC ports of Gen 1. I seriously need to play this game. They should remaster this game. It was a great game! Pokemon Stadium 2 is the better game, but by god this game's got it in the soundtrack department. Great game for its time I still have the original N64 version of it along with the second one. I hope they release them on Wii U Virtual Console at some point. @Expa0 This. Stadium 1 was my childhood, It sounded awesome and looked great. But at the end of the day stadium 2 was the better game. Man, I loved the Pokemon Stadium series. I must've played the 2nd one for months straight! So imagine my disappointment when Colosseum came out and got rid of all these awesome features... I think that's a main reason why I kinda fell off after Gen3. I farmed the game so much to get more starters and one off Pokemon like Eevee. Iwata did an amazing job with the coding of the game's battle engine. Never got round too playing this but will check it out if comes out on the Wii U VC. So much was great about this - the use of the transfer pack, the mini games, and the awesome Dodrio mode - shame this hasn't been repeated. Stadium 3 never happened and that's sad...and no Coliseum is not the same. That said, there's no point in play the first since the second game is better in every single way. Oh my a mod with gen III, IV, V and VI and the same mechanics would be awesome! I recall playing either Pokemon Stadium or Stadium 2 on a demo kiosk as a kid while my mom did her shopping rounds at the local WalMart. It amazed me at the time how cool Pokemon could look in 3D and kept me entertained. Unfortunately I never had a N64, and my first 3D Pokemon game was the mediocre Pokemon Battle Revolution on Wii. I loved being able to play the original Pokemon gameboy carts, then I loved battling my monsters in Stadium. Fun times! Kids Club got me wondering if Nintendo would ever make a Mario Party styled game featuring Pokemon. A dozen Mario Parties, a couple of Wii Parties, and an amiibo Festival later, I still wonder. It's all fun and games until you get rolled in the Prime Cup by the Gambler. Seriously, how do you land 3 Horn Drills in a row? Oh is it coming on the e-shop? Another "this isn't actually coming to the VC, we're just doing it just because" fake-out. First Fire Emblem 4 and now this. its probably bad that i was disappointed about the turn based combat. i didnt know much about the gameplay before it released and i was expecting a POKKEN style game. Still really fun though but like the article says, the turn based combat is somewhat slowed down which can be a bit of a downer. @Pants98 This would be genius. @Acein210 No, no, no, Stadium 2 is 10/10. I honestly thought this was on the Wii U VC when I first saw this review. I gave my original copy to some kids after I had my own. Now I wish I could play it with my girls. Maybe Nintendo will release it on Wii U virtual console again. There would definitely be interest. My kids definitely like Pokemon Go. Integrate Pokemon Go into Stadium and I'd be thrilled. @Acein210 Do you comment on every post related to pokemon "gen 1"? This was a great game for its time (although nothing other than its own direct prequel even comes close to "XD: Gale of Darkness" as the all-time best console Pokémon game). It's a shame that "Pokémon Battle Revolution" dropped several of the best features of the Stadium games. @Frank90 Well, I've heard the second game has crappy rental Pokémon, and of course you may prefer more of the minigames from the first game than the ones in the sequel, but otherwise yeah "Pokémon Stadium 2" is the superior game. Poke Stadium 1 and 2 is still lots of fun, if you have a Transfer Pak and some 1/2 gen games. Poke Stadium 1 back then was especially useful for farming starters and rare (Eevee, Omanyte, Kabuto etc.) Pokemon. Bah, I'm currently replaying Pokemon Silver, just to make a nice, well-balanced team (actually, my second one, the very first winning squad is sitting on my Crystal) and try to beat all of the cups in Poke Stadium 2 once again. @Fandabidozi Haha, prove to me you've beaten Round 2 of Pokémon Stadium and you have a deal! @Claytonbob It my biggest hope that the new Pokemon title for NX will be a Stadium 3 allowing you to integrate your Pokemon GO captures. Given the popularity of GO, it just feels like a no brainer and great system seller. Also, yes...the Sushi mini-game was great. My friends and I all became way too good at it and the competitions was fierce! Anyone else see this and get really excited that they'd re-released it on WiiU to go with the 3DS VC releases? Then equally disappointed shortly after? I completed this like three days ago for the first time. Just taking a break before I tackle Stadium 2. What I like most is being able to play the Game Boy games in Dodrio mode. This was one of three games I really loved on my N64. The others being Pokemon Snap and Super Smash Bros. I also thought this review was for a VC game and was wondering why there was no mention of how all these different mechanics work (or don't) in the VC release. I didn't really play Pokémon back in those days, so I missed this one, and was wondering if my Pokémon from my 3DS VC version of Red could be brought in to fight. If so, I thought I might pick it up. But all that is moot because this is just a review for the original. NX needs a game like this where you can import your Pokémon from Pokémon GO and do online battles. I can almost guarantee it would sell 2.5 copies for every human being on earth. I see your point. I guess what I really enjoyed about the Pokemon Stadium games (especially 2) was the experience of loading your game save in and being able to use it in many, many different ways. It didn't matter if you were a beginner with weaker Pokemon, or an elite class with tons of Lv100s. The minigames even let you use your own Pokemon in them. In Colosseum, you had that 1vs100 thing which required you to be at least at lv50 (if memory serves me right) and an RPG that, while impressive on its own, was almost entirely separate from the Ruby/Sapphire experience. The most you could do was transfer your Pokemon over, and that's only after you beat the game. @SmaMan Actually, you can also use it with your GBA games to battle in 3D against either another GBA game or a story mode team.